Click left or right to see our badges. Add those you like to the wishlist then hit "Request Quote"
can take P-Touch labels and laser paper. H5 classically styled, oval badge with a gold plated frame. 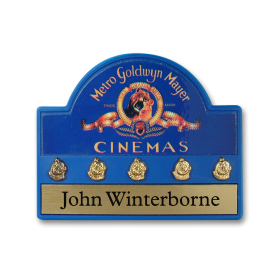 Gold logo to match and is permanently named. The bagde is full face printed under a poly-carbonate lens. 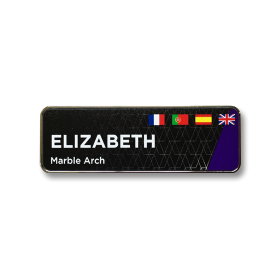 It can be named using label tape or laser printed paper (using standard office equipment). Inserts are provided. 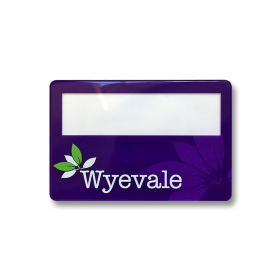 SL6 slim injection moulded plastic name badge from an anti-microbial white plastic. 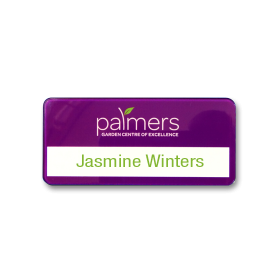 P3 Brushed Silver metal panel name badge, with rounded corners. Tape and label printer availabe. 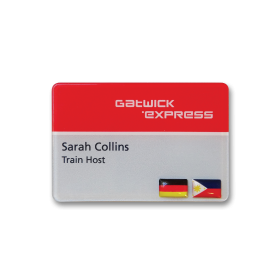 MS101 is a tough injection moulded plastic name badge moulded in a anti-microbial blue plastic. 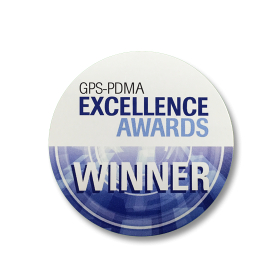 It can accommodate 5 awards. Language flags permanently printed to suit the individual. Print your own using standard office equipment. Perforated laser paper supplied if required. 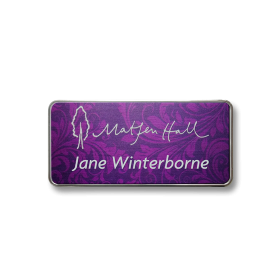 H4 classically styled moulded name badge in a robust chrome plated frame. 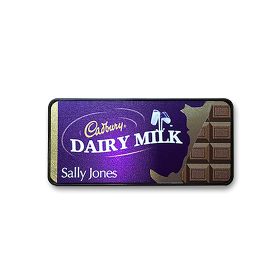 It has a metallic print background with logo and personalisation in white. in an highly reflective gold frame. made from an anti-microbial white plastic. Standard shape. Panel insert. 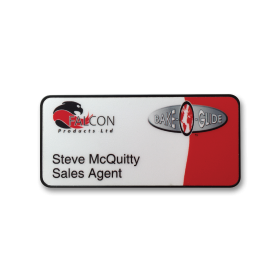 P3 Silver faced metal panel name badge with rounded corners. 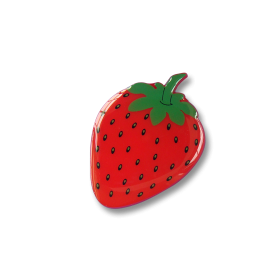 This one is specially moulded in in the shape of a strawberry. 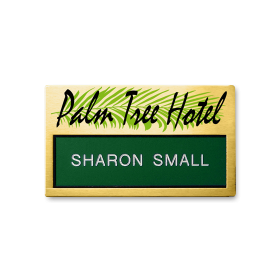 PX Metal panel name badge with rounded corners. full face printed, permanently named. with a metallic panel insert printed to the design. with a plastic panel insert printed to the design. Self naming using a P-Touch Tape. 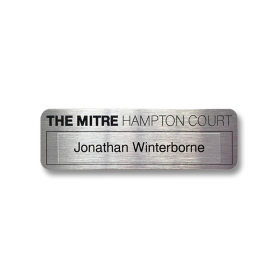 This website is serviced by Thomas Fattorini, Britain’s most experienced badge maker, for over 60 years. 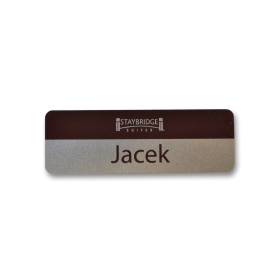 The purpose of this website is to help you choose and select a practical and functional name badge for you, or for your organisation. By asking you a few questions you are able to filter out the badge types that are not suitable or practical for your needs. You are then left to choose a couple in a style that you like the look of. We will then get back to you to fine tune the details before offering you a quotation, without obligation. If you’re looking for something simpler for an event or conference, please visit our 1st badge website – badges for busy people. 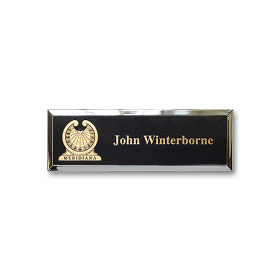 We are a pioneering name badge manufacturing company based in the UK that loves to offer the greatest choice of badges which are robust, high quality and of great value. 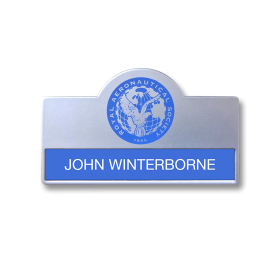 Thomas Fattorini (1932-2010) patented the first plastic moulded personalised name badge in 1964. 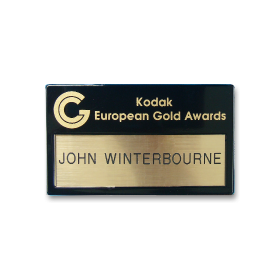 Today we continually innovate to ensure that we can offer you badges that are elegant, unique, fit for purpose and ones that you and your staff would be proud to wear. We also offer an efficient family friendly service. Welcome to the Badge Butler website. 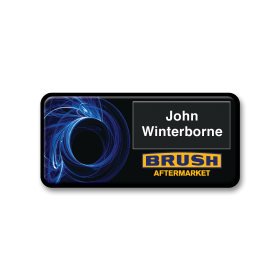 We specialise in quality robust name badges, lots of choice and great value. 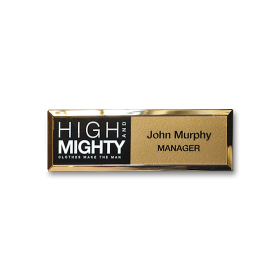 I hope you find this site useful, and that it helps you to find a dignifying name badge that you will be proud to wear.